Celebrating 30 years, Sony recording artists Led Zepagain captures the heart and soul of “the world’s greatest band”, replicating the ultimate Led Zeppelin experience. Jimmy Page says, “It’s as close as you’ll ever get to the real deal”. From the high-energy electric classics to the beautiful acoustic works, you will be mesmerized as LED ZEPAGAIN resurrects Page’s soaring guitar leads, Jones’ brilliant keyboard passages, Bonham’s trademark pounding rhythms and the signature Robert Plant vocals. As you experience immortal classics “Stairway to Heaven”, “Immigrant Song”, “Whole Lotta Love” “Rock ‘n’ Roll” and “Black Dog”, you’ll understand why Led Zepagain has become highly regarded as the most authentic representation of Led Zeppelin in the world today. 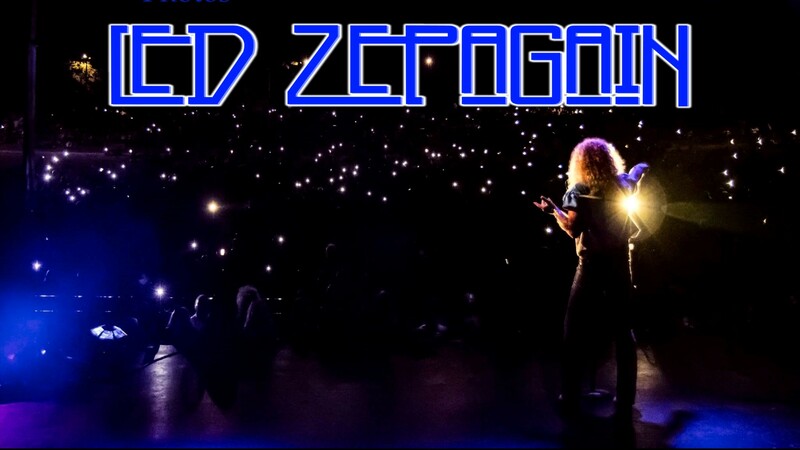 With well over a million downloads on iTunes to their credit, Led Zepagain has also entered pop culture, having been mentioned on network TV shows “The Gilmore Girls”, “Chicago Fire” and “Bad Judge”. When Led Zeppelin guitarist Jimmy Page attended a Led Zepagain show at the House of Blues in Los Angeles he was absolutely astonished stating, “It’s amazing how much you sound like us. You were inside the music, and you paid attention to detail in your presentation. I can tell you really love our music!” As a result, members of Led Zepagain attended Led Zeppelin’s 2007 Reunion Concert at London’s O2 Arena by invitation of Mr. Page. Additionally, the band received a surprise visit from Jason Bonham in March of 2009 as he sat in with the band on their encore performance of “Rock and Roll”; www.youtube.com/watch?v=2w6noToYSqQ. Led Zepagain has been featured on AXS TV’s “World’s Greatest Tribute Bands” (2014) and were asked to return, performing the iconic Led Zeppelin album “lV” in its entirety (2017). The band consists of vocalist/harmonica player Swan Montgomery (“Robert Plant”), guitarist/mandolinist Anthony David Thymiakos (“Jimmy Page”), bassist/keyboardist/mandolinist Jim Wootten (“John Paul Jones”) and drummer/percussionist Derek Smith (“John Bonham”), playing to packed houses around the world. From the sound and the look to the vintage equipment and costuming, Led Zepagain will be the closest thing that you will ever see to a live Led Zeppelin performance! Come on out and see what Jimmy Page was talking about. Tickets go on sale to Stockey Centre Members on Thursday February 28th at 10am and to the general public on Friday March 1st at 10am. To become a Stockey Centre Member, contact our Box Office at 877-746-4466 or visit us at 2 Bay Street. Stockey Centre Members enjoy advance notice of events, advance purchasing privileges, and occasional discounts on tickets when purchased during the advance member purchasing period.